 A cyberspace yarn from the author of The Hollow Earth (1990), etc. Jerzy Rugby writes computer programs for a company developing a household robot and shares his apartment with Studly, an advanced prototype. Jerzy finds that his equipment is infected with ``ants''--rogue programs like viruses apparently released by his oddball-genius boss, Roger Coolidge. Suddenly, he's fired and immediately hired by a second company that is developing a rival robot. Studly releases the ants into the global TV system, which promptly crashes, leaving Jerzy facing a major lawsuit--though his new company bails him out and provides a lawyer. But once Jerzy has perfected the robot, his contract is terminated (no more bail, no more lawyer). 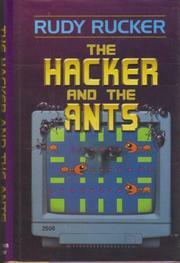 The ants, meanwhile, have occupied large areas of cyberspace and are rapidly mutating, intruding on the real world to develop robots of their own. Naturally, they turn on their creator, leaving Jerzy with a dangerous mess to sort out. Sophomoric and excessively didactic, with an obscure plot: of interest largely to teenage computer buffs and Rucker regulars.